The Weighted Hand Writing Glove is a uniquely designed weighted pouch that comfortably fits on the back of the hand. 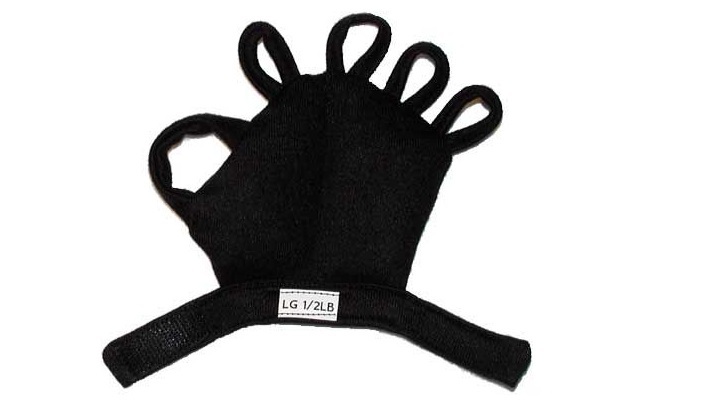 The open palm and finger loops allow the user’s fingers and wrist to move freely. People who experience tremors during fine motor tasks will find this adapted hand weight provides excellent proprioceptive input and additional hand stability. The HandiThings Weighted Hand Writing Glove is a durable Lycra material pouch that is double stitched for strength, and filled with lead free steel shot. The weight is held in place by elastic thumb and finger loops and a hook&loop (Velcro) wrist strap. Users will find this weight easy to put on and take off, and cooler to wear than a standard weighted glove. This adapted hand weight leaves the palm of the hand completely open. The HandiThings Hand Weight is filled with lead-free steel shot and will fit the left or right hand. Extra small has 1/4 lb. of weight, Small has 3/8 lb. of weight; Medium and Large have 1/2 lb. of weight. To determine the size needed, measure along the base of the index finger to the base of the little finger along the palm (MP joints across the palm of the hand).